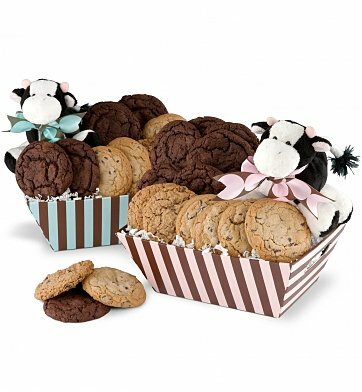 An adorable plush cow arrives for baby, along with a collection of eighteen fresh baked, decadent and oh-so-chewy cookies for mom and dad. Presented in a striped caddy that's perfect for the nursery, this is an especially sweet welcome. Plush Cow and Striped Basket. Each cookie is individually wrapped for freshness. A complimentary card with your personal message or greeting is included with your gift. if ordered by 12:00 pm EDT Tuesday April 23rd. New Baby Cookie Basket is a hand delivered gift. These gifts are delivered by one of our local design centers located throughout the United States and Canada. Same day delivery is available for most gifts when ordered before the cutoff time. The cutoff time for New Baby Cookie Basket is 9 AM in the recipient's time zone. Fresh cookies for Mom and Dad, and a darling plush cow toy for the new baby! Each cookie is individually wrapped for freshness. Delivered presentation-ready in a keepsake striped basket. Arrives accentuated with a plush toy cow. A nice little gift for the new parents. They really enjoyed the cookies with an adorable little plush toy for baby. This was given to a couple who had just had their first child. They loved it and said it was delicious! !